Aleksei Yuryevich German (Russian: Алексей Юрьевич Герман, IPA: [ɐlʲɪˈksʲej ˈjʉrʲjɪvʲɪt͡ɕ ˈɡʲermən]; 20 July 1938 – 21 February 2013) was a Soviet and Russian director and screenwriter. German was born in Leningrad (now St. Petersburg, Russia) in 1938; his father was the writer Yuri German. He studied under Grigori Kozintsev until 1960, and then moved on to working in theatre before joining the Lenfilm studio as an assistant director. He made his directing debut with Sedmoy Sputnik, co-directed with Grigory Aronov in 1967. Over the course of his career, many of his projects met with production difficulties or official opposition; in 50 years, he managed to complete just six feature films, his final film being the science fiction film Hard to Be a God, which debuted at the Rome Film Festival in 2013. Trial on the Road (1971) is the film that made Alexei German famous. It was banned for fifteen years and was "on the shelves" of the Ministry of Culture of the Soviet Union until its release (1986) during the Gorbachev era. However, the names of all of the crew members who emigrated to the United States (DP Yasha Sklansky (or Yakov Sklyansky), Assistant Director Leo Zisman (or Leonid Zisman) and Production Manager and Assistant Director Leon Weinstein (or Leonid A. Weinstein)) were erased from the credits. The same is true with Natalia Toreeva, Costume Designer on German's film Twenty Days Without War,. In 1987, at the Rotterdam International Film Festival (Netherlands), Alexei German, as a director, received a KNF Award for his three films, Trial on the Road, Twenty Days Without War, and My Friend Ivan Lapshin. German was married with the screenwriter Svetlana Karmalita; they had a son, Aleksei Alekseivich German, who is also a film director. Most of German's films are set during the Joseph Stalin era and the Second World War, and they depict the time period in a critical light. His films, shot mostly in black and white or very muted color, have a distinctive "murky" look and are often described as looking "aged." He was known for his obstinacy as a director, for featuring protagonists who could be categorized neither as heroes nor antiheroes, and for casting actors against type. ^ His surname is sometimes transliterated Guerman or Gherman to indicate that the Latin script ⟨g⟩ is "hard". 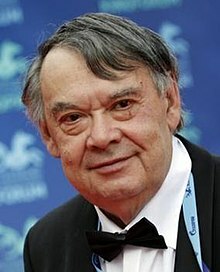 ^ "Legendary Soviet Filmmaker Dies at 74". The Moscow Times. 21 February 2013. Retrieved 23 February 2013. ^ Bergan, Ronald (26 February 2013). "Aleksei German obituary". The Guardian (UK). Retrieved 18 March 2013.